Tribune file photo Rep. Greg Hughes, chairman of the Utah Transit Authority, says travel is an essential part of the public agency's mission of innovation and expansion. Hughes says a recent trip to Switzerland opened his eyes to the possibilities of a mountain transportation system in Wasatch Front canyons. He also has in the last 18 months taken UTA-financed trips to Hong Kong, Australia and several U.S. cities. This file photo shows Hughes on the floor of the Utah House, where he serves as a representative of the Draper area. In 2013, I became aware of significant problems with the lack of transparency in the political process in Utah. Prior to that time, contributions made directly to a candidate or to a Political Action Committee (PAC) were legally required to be disclosed, while donations made to 501(c)(4) non-profit advocacy organizations for use in a political campaign could be made anonymously. From my perspective, it didn&apos;t make sense to have differing standards for various entities engaged in the same political activities. If we were going to require some groups to disclose and not others, there would obviously be significant incentives for distortion within the process. I concluded that the public would be better served by greater transparency and consistency under the law. As a result of these concerns, I sponsored legislation (House Bill 43) which standardized disclosure and reporting requirements for all political activity regardless of the type of organization doing the work. Needless to say, it was met by fierce opposition from political operatives of all stripes. But in the end, I am satisfied that the people of Utah got a much-needed boost to the openness of our political process. Voters now have a greater ability to understand the motives of those involved and the messages they put forward. While I firmly believe in the fundamental right of free speech, it is imperative that the listener be allowed to determine who is doing the speaking and why, in order to intelligently weigh the information expressed. As it turns out, the passage of HB43 has proven to be quite judicious in light of the revelations recently exposed as a result of the House investigation of former Attorney General John Swallow. The inconsistency in the law had resulted in what was essentially a convoluted money laundering scheme whereby candidates were able to wash contributions from PACs through 501(c)(4) non-profit entities, thereby shielding the identities of those bankrolling specific candidates and issues. According to investigators, just one 501(c)(4), the Proper Role of Government Education Association, was able to funnel more than $450,000 in contributions through its coffers. This money was then inserted into Utah races without donor disclosure and no ability for the voters or the press to determine where the money was actually coming from and what the motives of the funders might be. In writing about this legislation in Utah Political Capitol, Curtis Haring stated, "If an individual or corporation is spending tens of thousands, hundreds of thousands, or even millions of dollars to influence an election – the public has a right to know who is paying for it. Hughes&apos; bill would provide a more level playing field and make the process more open." 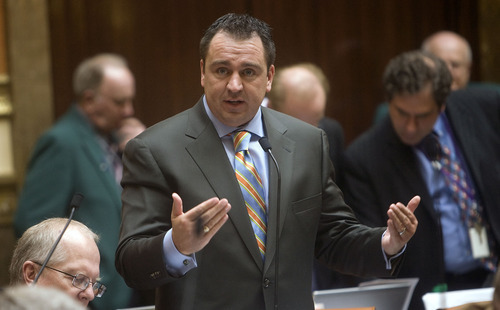 Greg Hughes is a state representative from Draper.